If there’s such a thing as Robo-mythology, one storyline that keeps coming up is that of the inner-robot. However well a robot is made and mimics a human, it will never be a human. From A.I.’s David to D.A.R.Y.L.L. and from the silly Short Circuit’s Johnny 5 to the gentler T-1000 in Terminator 2 as well as the many robots of Isaac Asimov’s stories (including Star Trek: The Movie, for which he wrote the screenplay), robots have shared their intimate, tragic feelings with us. 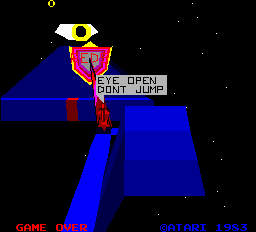 But only Atari managed to truly put us as close to the inner-robot as ever-yet. Also known as “one of the most impressive failures in arcade history”, I, Robot hit the parlors in 1983. The cabinet design stood out from all other arcades. Atari used a design that was similar to that of FireFox and the dedicated Major Havoc cabinet. The 19” horizontally positioned color CRT monitor was enclosed in a square box, which was supported by a sleek base / pedestal. The game was the first to feature a unique trigger-joystick, the patented Halo-effect joystick. With this joystick, the player controlled another first: the point-of-view. This was not just a gimmick, but actually a feature that you needed to successfully play the game. With alternating angles came of course the most important achievement of this arcade: it was the first to feature fully shaded polygon graphics. The aim of the game is not too complex. You control a sexless, neutered “interface robot #1984”, and have to destroy the Evil Eye that’s watching you, by removing it’s protective shield. You do this by gliding over the red parts of maze / platforms you balance on. Other than that you jump around and shoot various obstacles on your way to the next level. One of these next levels is outer space, through which you fly and shoot more polygons and such. In all there’s 99 levels to advance through, but finishing certain levels allows you to skip a few. If Spielberg would have been a true robo-connoisseur, he would have named A.I.’s Rouge City “Doodle City” (well, okay, that wouldn’t have made much sense), after the oddest feature to hit the arcade for the first time. For the price of two lives and a credit, players could doodle around for 3 minutes and paint with the game’s sprites, in 3D space, no less! Unfortunately the game was given the wrong finger by players, and was highly unpopular, only played by geeks and robo-lovers. Legend has it that only 1,000 coin-ups were made (actually retrofitted FireFox cabinets), and that of these only 500 were sold. The rest was shipped off to Japan. It’s more likely though that a run of 1,500 machines was done. If you want to see I, Robot in action, check the out-takes on the DVD of The Goonies, where it’s located in a convenience store. If you like robots, and are somehow not familiar with Asimov’s work, I, Robot, his first short-robot-story collection, is a great starter.